Dexterity and balance are both front-and-center in Tip-It. Although Ideal released it in 1965, Tip-It was originally designed by Marvin Glass & Associates. Setting up Tip-It is almost as fun as the game itself. 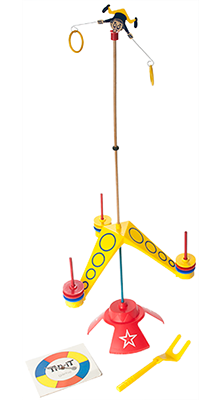 The game board consists of a series of interconnected poles and a tripod, all attached to a plastic base. Discs are distributed in a specified color sequence among three pegs attached to the tripod, and the acrobat is balanced precariously at the top of a long pole. Once set up, the game is over two-feet tall! 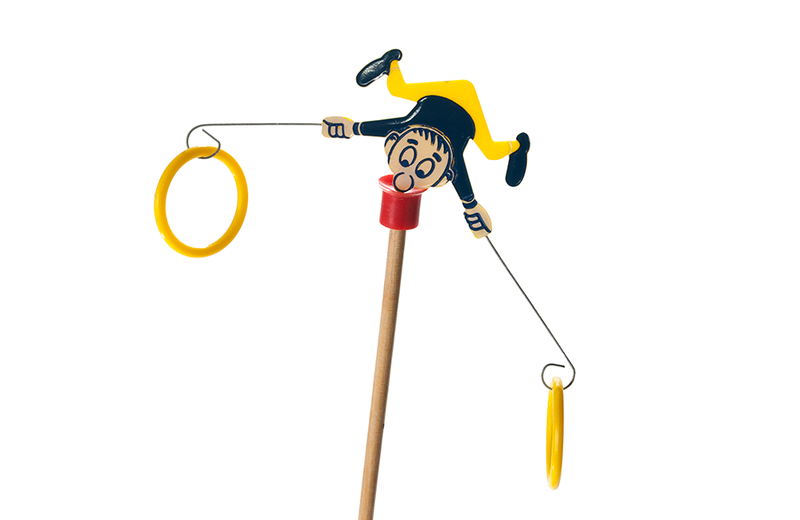 The object of the game is to acquire various colored discs (each worth a certain number of points) without causing the acrobat to fall off his perch. Each player spins the spinner to determine which colored disc should be removed from one of the three pegs using a special lifting fork. Depending on its color, a disc may be worth 5, 10, or 25 points. Ten discs or 100 points wins the game. Tip-It became an enduring classic for Ideal, remaining in production for over 20 years. Later, Mattel eventually reissued the game as part of its Classic Game series. Today, Cardinal Industries sells a variation on the original that features a series of licensed characters, such as Spiderman, Disney, and Star Wars. Released in 1978 by Kenner, the Electronic Play ‘n Playback Organ is really three toys in one. Growing up, we had a large playroom in our basement. The benefits were two-fold. From my parents perspective, it prevented “toy sprawl.” But to me, it was the perfect place to unleash my inner engineer using construction toys like Tinkertoy, Lincoln Logs and Legos.